Windfloaters | Great Day Inc. It is important that a hunter knows the direction the wind is coming from. It is more important that he knows where it goes once it passes him. The wind does not travel in straight lines. Wind currents move upward and downward, swirl and change directions. Without knowledge of the wind patterns, the hunter is handicapped in treestand placement, in knowing how high to hunt, in timing shots and especially in predicting wildlife movement. Windfloaters are feather-light, natural fibers that float along with wind currents - following every updraft or downdraft - accurately tracing the wind's path. No other wind detecting products are capable of this. By releasing two or three of the Windfloater fibers periodically, the hunter can establish an invisible line of where his scent is being carried. Windfloater some in a package of approximately 50 fibers, usually enough to last an entire season of hunting. Windfloaters can be used effectively from ground level or from a treestand. In mountainous or hilly terrain, Windfloaters are especially helpful in detecting and adjusting to changes in thermal wind patterns. 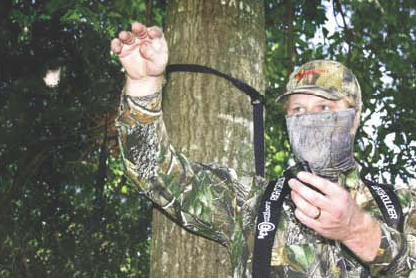 In flatter terrain, a softer, almost undetectable breeze is a bow hunter's worst enemy. In these conditions, scents tend to settle to the ground closer to the source. By using only a few Windfloater fibers at a time, a "soft" wind can be pinpointed and dealt with effectively. Then, the hunter has a tremendous advantage in selecting the entry point and path to a hunting area, determining treestand placement, shot timing, etc. Remember, being clean and scent free is always a good start in dealing with the wind. 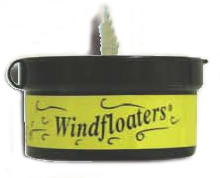 Then, Windfloaters take you to the ultimate level of scent management.